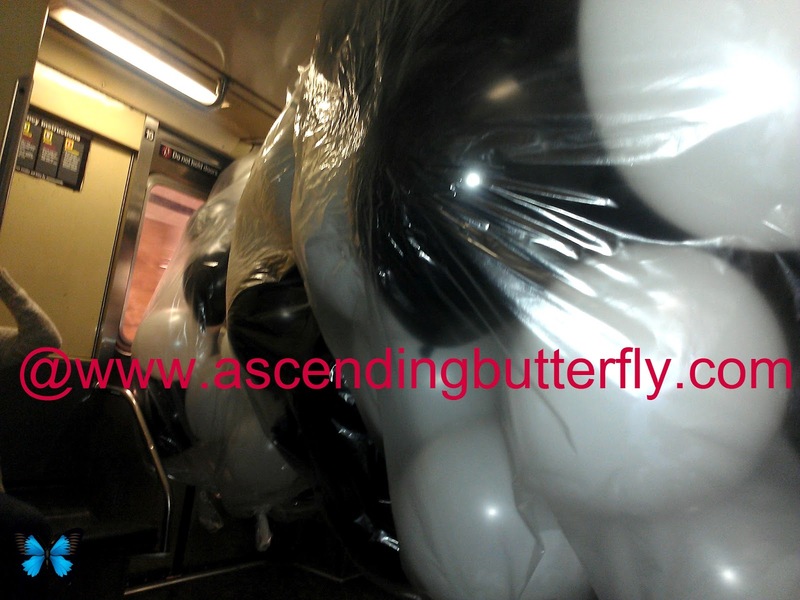 Ascending Butterfly: Wordless Wednesday: I got attacked by balloons on the @MTA #Subway! Wordless Wednesday: I got attacked by balloons on the @MTA #Subway! Bloggers, feel free to link us to your Wordless Wednesday Post as a link in the comment section so we can visit you too! FTC Disclosure: This is NOT a sponsored post. This is a random slice of life on a New York City Subway Train where two oversized bags of balloons took over the car and all we could see was the person's feet beneath the bags! The next day I rode the train with a pitbull (the dog, not the famous singer) and last night I rode with a chihuahua dog in our car! (Neither were service dogs by the way!) These Balloons made me think of Times Square at New Years Eve - I love Black, White and Gold Balloons for New Years Eve, don't you? Balloons and Champaige Bubbles make happy !